As I was wandering along the pathway beside Cornmeal Creek, I almost stumbled over this paving insert, which, the observant among us will note mimics the pattern on the banner flying above. It's a graphic representaion of mangroves and their importance to the ecosystem, which perhaps I find a little ironic given that the creek has had the full engineering anti-erosion treatment with rock and mesh sides, hardly conducive to mangrove growth. 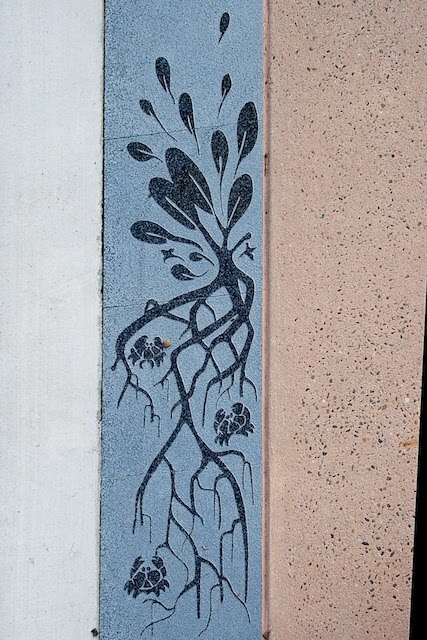 Perhaps the terrazzo from which it's made is meant to be a black artistic reference to a tombstone?